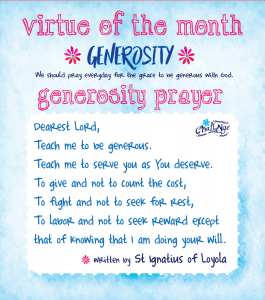 The virtue of the month for Challenge and Conquest in June is generosity. Generosity is a virtue where you give of your self or your things without looking for anything in return. The funny thing about generosity is that it comes from the heart so it is not how big the gift is that matters, but rather the value it has to the person who gave it. Generosity does not need to be in money or things. You can be generous with your time or attention too and sometimes that is harder. Generosity is definitely a Christian virtue because Christ lived it. He was always giving of his time, listening and helping others. He gave his life for us on the Cross and he gave us his body and blood in the Eucharist. “God so loved the world that he GAVE his only son…” Giving is something God does because God is love. Generosity springs from a loving heart. God gave us everything we have and we should be completely generous with him. God is generous with us through his grace. By grace we mean God’s free, loving gift to us, his helping goodness, the vitality that comes from him. 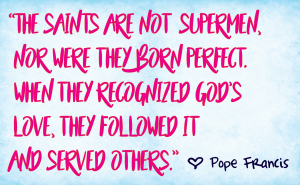 Grace is everything God grants us, without our deserving it in the least. Grace is not a thing, but rather God’s communication of himself to men. In grace we are in God. In Matthew 6:19, Jesus said ““Do not store up for yourselves treasures on earth, where moth and decay destroy, and thieves break in and steal. But store up treasures in heaven, where neither moth nor decay destroys, nor thieves break in and steal. For where your treasure is, there also will your heart be.” This passage is so important for us to understand today about generosity and riches. Jesus is not telling his apostles to be silly and not save or manage their money wisely. He is telling them to make sure their hearts are not focused on just material goods. Treasure is an important thing to understand in this passage. We all have things we treasure in our hearts, like memories or loved ones. We can also treasure things that mean something to us and sometimes they are silly things that mean nothing to anyone else – like a flower, or a card or a ticket stub. Usually these items are not actually worth much in money but they have great value. Our faith is something we should treasure in our hearts. It has an intangible value – you can’t put a price tag on it, but it is worth more than all the gold in the world. Jesus knows how we can be tempted by greed or money. He knows that people will always look for ways to make more money or have more money. People who are consumed by money and wealth, hold it as their supreme treasure and goal. They will step on anyone and sacrifice anything to make more money. This is what they treasure most and this is what they love the most in life. Jesus is telling us that generosity is only possible when we don’t get our hearts attached to these things. You can have money or wealth and not be attached to it. You can also have very little money or wealth and be very greedy. It depends where your heart is. The Youcat number of the month is all about love and generosity. # 402 What is love? Love is the free self-giving of the heart.